The cost of owning a condo is not as complicated and financially strenuous as most people think. Once the condo is purchased, the mortgage is one of only a few monthly fees. Each condo has an association that regulates the finances of the building as a whole. The association charges each owner a monthly fee; usually based on the square footage or number of bed rooms in the unit. These monthly dues typically include insurance on the unit, waste management, cable (most of the time), sewer, landscaping, maintenance and basic care of the property. 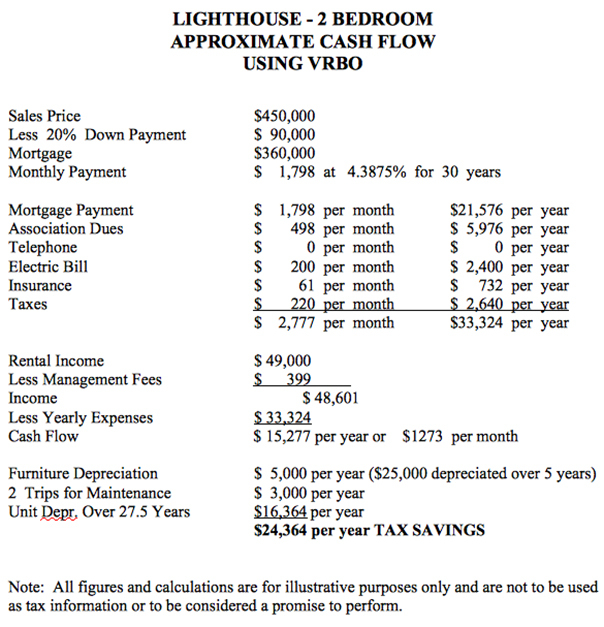 *This Cash-flow statement was done for a 2BR Lighthouse condo using our supplemental network. 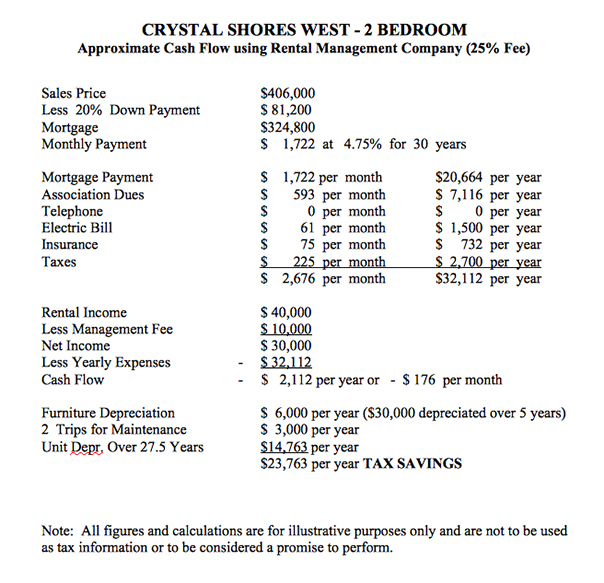 *This Cash-flow statement was done for a 2BR Crystal Shores West condo using our supplemental network. 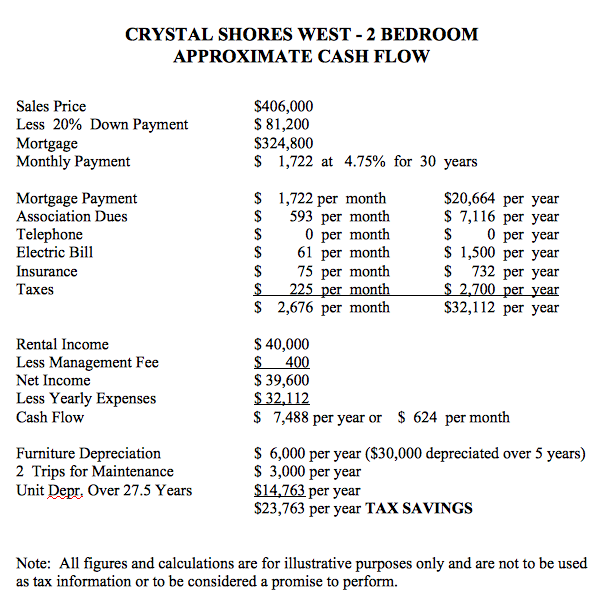 This Cash-flow statement was done for a 2BR Crystal Shores West condo using our supplemental network. If the property is a rental unit, the owner has a couple of options. They will want to contract an agency to advertise the property and maintain the unit during the times the owner is not using it or manage the unit themselves. We actually help our clients with rental traffic using our condo network. The fees for this service usually range from 15-30% of the gross rental income, depending on the needs of the owner. There are ways to minimize these fees and supplement the income by renting the unit yourself. Utilities account for most of the monthly costs. An optional contents policy can protect owners from the following: damage by renters, accidents to renters and loss of income due to outages. With the prices where they are now, the "out-of-pocket" expense of owning a condo on the Gulf Coast, is as low as it may ever be again. The cost is around $300 per square foot. 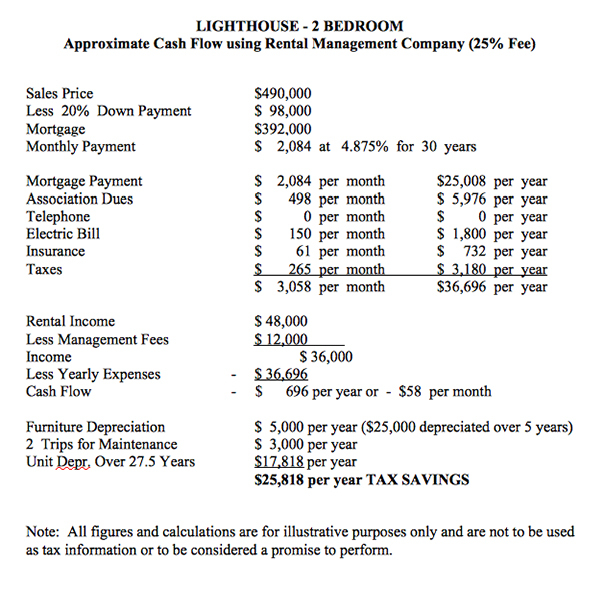 For a detailed idea breakdown of a specific condo, please request a cash-flow analysis by emailing info@condoinvestment.com or calling (251) Area-Pro with any questions. The Gulf Coast is home to some of the most beautiful beaches in the world and this is constantly corroborated by various publications and shows up in article after article. This is not something only found in small articles, but the large country-wide papers, magazines and websites too. The emerald-green waters and sugar-white sandy beaches are truly something to see. It's no wonder why the annual traffic to our South Alabama coast increases year-after-year. This is not only opinion, but the annual taxable revenue increases each year, meaning that more and more people are coming to the beaches of Gulf Shores, Orange Beach and Perdido Key - which is in Florida, but shares a border with Orange Beach. We've published as much info as possible to help potential buyers to find all of the info they need from the comfort of their living room. In the past year, the NAR has allowed for the publication of recently SOLD info which helps to find the actual value of a condo or home on the Alabama Gulf Coast. (Find recently SOLD condos using our quick links to find any condo on the Alabama Gulf Coast) This was mainly to help Realtors compete with Zillow, Trulia and other similar websites that have long had the ability to publish this info - mainly because they are not real estate websites, but "media sites" and use third party vendors to accomplish this. But they are not nearly as accurate for a number of reasons. CondoInvestment.com gathers info directly from the local MLS and actually IS a real estate website. We also publish info on all local listings including pictures, property details, interactive Google maps and mush more info for the Gulf Coast - like our exclusive aerial imagery. 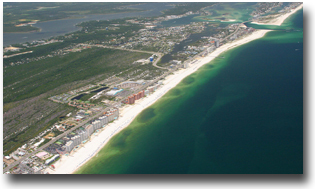 Finally, find all Gulf Shore condos for sale and Orange Beach condos for sale on the Alabama Gulf Coast along with Perdido Key condos for sale on the Northwest Florida Gulf Coast. For our investment-minded buyers, we've published revenue for all Gulf Coast condos which is accessible from this link or each condo's sales page also contains revenue info for each condominium.